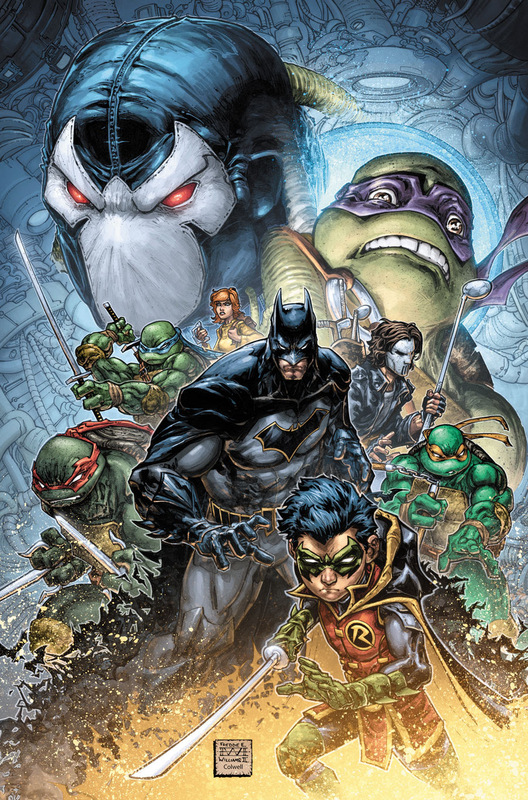 Gotham’s Dark Knight joins forces with New York’s Heroes in A Half-Shell this December as DC Entertainment and IDW Publishing today announced plans for BATMAN/TEENAGE MUTANT NINJA TURTLES II, a six-issue follow up to the smash-hit crossover series of 2015. Writer James Tynion IV (BATMAN, DETECTIVE COMICS) and artist Freddie Williams II (HE-MAN/THUNDERCATS) will reunite for this second meeting of two icons of pop culture. When Donatello goes looking for a new mentor to help him improve his fighting skills, he opens a doorway to another reality, hoping to summon the Turtles’ one-time ally, Batman. But instead, he gets sent to Gotham City and someone else comes through the open portal —Bane! Suddenly, there’s a new gang boss in New York and he’s out to unite all the other bad guys under him. Can Donnie get back in time and bring Batman with him to help his brothers before Bane causes irreparable destruction? As an added bonus for fans, the first two issues will release in December before going monthly. Issue #1 hits comics retailers and digital outlets on December 6, with issue #2 following two weeks later on December 20. In addition to covers by Williams II, Teenage Mutant Ninja Turtles co-creator Kevin Eastman will illustrate variant covers for the series.